By now I think everyone I have ever met knows how much I love peanut butter and chocolate. Actually, I am at a loss for how someone does not love this combination, the exception being those who are allergic to nuts! Once a month a group of us brings dinner to Quantum House in West Palm Beach. It is a home for families whose children are patients in St. Mary’s Hospital. It gives us such joy just knowing that the one thing families don’t have to worry about is dinner. Last month I was short on time and made a batch of brownies that had an Oreo cookie layer in the middle. I cut the brownies in triangles, so everyone could see the cookie in the middle. As I sat there listening to everyone’s comments, I started thinking about the bag of Nutter Butter cookies in my pantry and knew exactly what I was going to do after I got home. 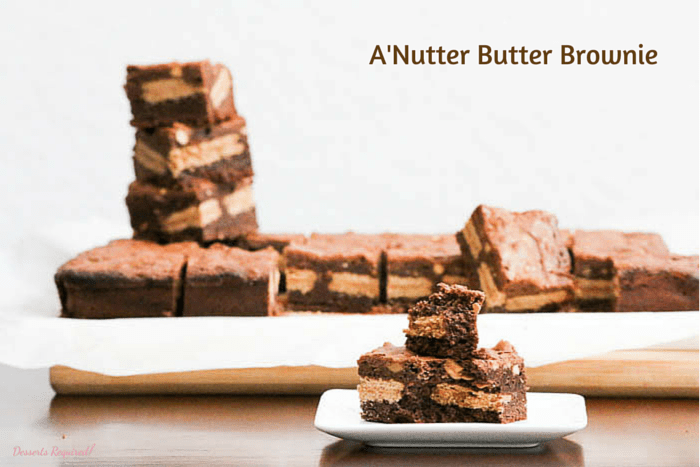 The Oreo Chocolate Brownies were a huge hit and I will be blogging about them soon, but I just had to share with you A’Nutter Butter Brownie because they are THAT good. Half of the batter is poured into the baking pan and then peanut butter cookies are arranged on top of it. Top with the remaining batter to which peanut butter has been added, bake and voila…you have a dessert that will be challenging to share. Yes, sharing you will do. Either that or you will simply have to make a second batch for all the people around you who will be begging for one or two or three! Place the eggs and pinch of salt in a mixing bowl. Mix on low speed for 20 seconds. Add the sugar. Mix on low until combined. While the mixer is on, add ½ of the chocolate mixture. Combine. Add the flour and baking powder. Blend in the remaining chocolate followed by the vanilla. Pour ½ of the batter into the prepared pan and spread evenly using a small metal spatula or the back of a spoon. Line the Nutter Butter cookies over the batter, keeping them close together. There will be 4 cookies across and 5 down with the long side of each cookie going down the length of the pan. Stir in the peanut butter into the remaining batter. Spread the remaining batter over the cookies. Bake at 350º for 35 minutes. Remove from the oven and cool completely. Lift the parchment paper out of the pan and transfer to a cutting board. 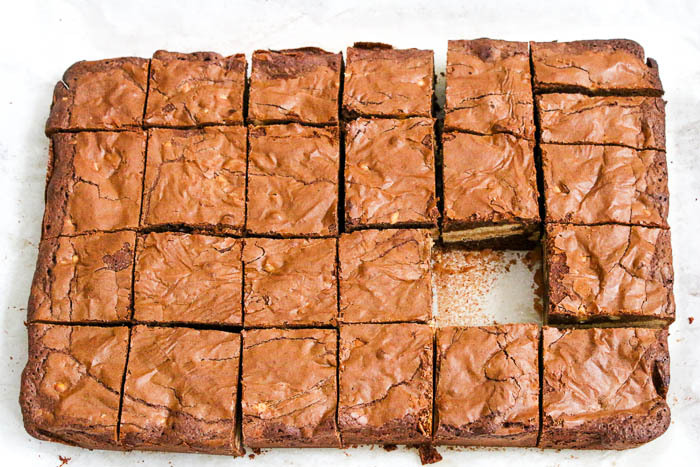 Cut the brownies in squares or triangles. What an awesome combination! Easy and delicious – my kind of recipe!!! Thanks so much, Julie. 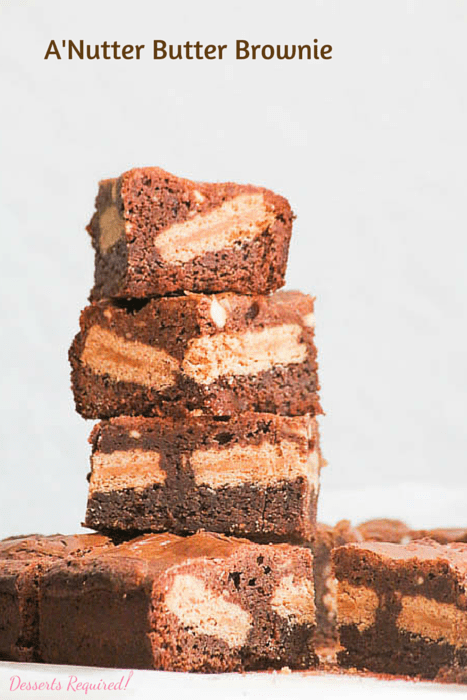 Easy and delicious makes life so much sweeter! !